1. Preheat the grill to high. Slash the skin of the mackerel, then rub all over with the tikka marinade and place skin-side down on a foil-lined baking sheet. Put the potatoes in a pan, cover with water, bring to the boil and simmer for 5 minutes, then drain. 2. Meanwhile, heat half the oil in a large frying pan on a high heat and cook the onion for 3-4 minutes until it starts to brown. Add the spices and cook for 30 seconds, then add the remaining oil, toss in the potatoes and stir regularly for 5 minutes till golden. 3. 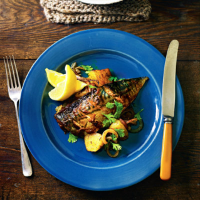 Grill the mackerel for 3 minutes, then turn and grill skin-side up for 1 minute. Serve with the potatoes, a scattering of coriander and lemon wedges.